BRAND: Copernicus Educational Products Inc. 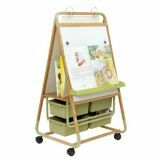 Built for flexibility and value, this chart stand is economical and includes a 1 year frame warranty. 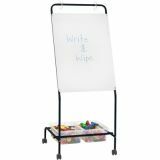 It features an adjustable bar to accommodate various sizes of bins/tubs (not included), along with a 24"W x 32"L dry erase whiteboard, and four 2" casters (2 locking). 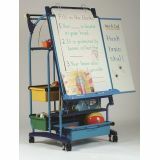 Measures 24"W x 24"D x 59"H.
Includes slide-out tubs with stops, book ledge, and holder for pointers. Made of renewable material. 100% recycled tubs. 3-year warranty on frames. Lifetime warranty on tubs. 31"W x 28"D x 57"H. Wt. 55. Slide-out board enlarges work space by 15"W. Large 3" casters. Foot-Activated Brake Mechanism.